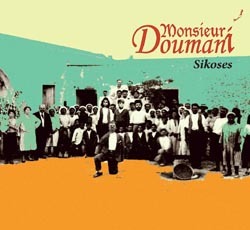 Monsieur Doumani is a trio from the island of Cyprus, and Sikoses is the group's second album. 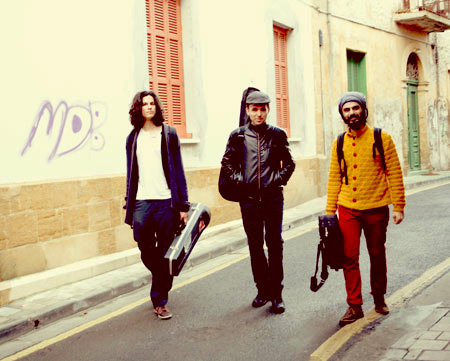 Together, Antonis Antonious (who plays the tzouras, a relative of the bouzouki), Angelos Ionas (guitar), and Demetris Yiasemides (flute and trombone) are credited with not only paying tribute to traditional Cypriot music, but also updating and experimenting with the island's folk music. While Monsieur Doumani's first full-length album, Grippy Grappa (2013), concentrated on traditional Cypriot songs and tunes, Sikoses ranges further afield, with original compositions and some occasional electronic manipulation from Antoniou. In a wonderful on-line documentary (see below) about Monsieur Doumani, Dr. Nicoletta Demetriou, an Oxford University ethnomusicologist, says that the trio “have managed, while being 'modernizers,' to essentially become very traditional.” Dr. Demetriou's intriguing statement needs to be contextualized. Cyprus' has a fraught history, with the island – once under British control – attaining independence in 1960. However, tensions between Greek Cypriots and Turkish Cypriots arose, with both Greek and Turkey exercising their claims to the island. Today, the Republic of Cyprus contains a Turkish Republic in the north – at least, as far as Turkey is concerned. This Turkish stronghold, it is fair to say, remains a contested area between the Greeks and the Turks. So, the idyllic Mediterranean locale that Monsieur Doumani calls home has had its share of political upheaval. On the economic front, the economic crisis that unfolded in America's subprime mortgage debacle rolled on to bedevil the world's governments. From 2012-2013, Cyprus found itself undergoing severe financial distress, resulting in an EU and IMF bailout and, of course, austerity measures. In 1967 A.L. Lloyd claimed, “The mother of folk song is poverty.” And folk music, being the music formed by the people through an oral tradition that shapes and re-shapes songs and tunes, has never shied away from calling out exploitation, corruption, and the trials of everyday life. Folk music also can provide a very decent party, while tackling the profound and the mundane. Utilizing Greek influences, Turkish influences, and plenty of inspiration from beyond the shores of Cyprus, Monsieur Doumani provides deep and profound commentary about present-day Cypriots and their current conditions. …one can hear this as poetic commentary on the economic crisis. Such lyrics, supported by wonderful music and the judicious use of Yiasemides' trombone, give the song a feeling of Greek burlesque: Monsieur Doumani are not afraid to speak their mind, but also deftly utilize humor to make baklava of political acid. Ionas sings on this track, warning the person who is the object of the song that he will be given a beating in order to wake up to a meaningful life, or else face the hollowness of his own soul. Yiasemides takes off like a siren, the flute sounding both brutal and sweet. This contradiction seems to summarize the Cypriot situation. In fact, many of the songs (“Gongs,” “The Bland,” “The Suitcase,” “A Beating”) seem to urge the listener to uncover some personal truth, or to face up to some falsehood. Or make a one time contribution of 25.00 (postage included, world-wide) and get just this album.